The latest eDiscovery applications are surprisingly easy to use. Sign in like you do with email, search like you do with Google, store data like you do with Dropbox, and best of all – let other people handle the tech stuff! That’s how you move files from one folder to another. You select them with your cursor, and while keeping the mouse button pressed, you ‘drag’ them to another folder and release the button. We do this even for text, and to upload files to the internet. In fact, it’s so common that it’s now part of our everyday lives. What we need is new technology that uses simple features like this. It’s daunting when we have to learn new skills just to use an application. So, we often put it off. And with eDiscovery, procrastinating will only hold your firm back. Instead, we need software that works off skills we already know. That’s what the new generation of eDiscovery applications do. They take something complex – like eDiscovery – and make it simple. So, instead of making us learn a bunch of new tricks, they use the tricks we already know. Like, dragging-and-dropping. Let’s take eDiscovery software ‘GoldFynch,’ as an example. GoldFynch is an increasingly popular eDiscovery application designed for small law firms like yours. It solves many of the challenges you face. For example, small law firms usually work with small budgets, yet your cases often grow exponentially. So, GoldFynch offers rock-bottom prices (as low as $10 per month) but still lets you scale-up for cases that are 100 GB and more. That’s why GoldFynch is the number one eDiscovery software for small law firms. So, how does GoldFynch simplify eDiscovery? Go to the GoldFynch pricing page. Choose your plan. I.e., how much storage space you need for your files. There’s a simple ‘slider’ to help you decide this. And you can get up to 100 GB and more! Sign up . . . it takes just minutes. No need to add a credit card. No sales calls. And you get a free, fully-functional trial case – 0.5 GB of data and up to 1 GB of processing. No need to download and install anything. To start working, just go to the GoldFynch website and sign in. It’s like checking email. GoldFynch is as easy to use as the simplest software out there. Check out the screenshot below. The menu on the left shows you everything you can do with GoldFynch. To upload files to GoldFynch, drag-and-drop them into your GoldFynch (i.e., internet) browser. GoldFynch handles all the complicated processing that follows. You can make simple searches. That’s with single keywords. So, you’d search for ‘John’ to find documents referring to your newest IT guy – John. But you can make highly specific searches too. Here, you’ll use keyword combinations to make an advanced search. With the right keywords, you can give a complex command like: “Find all emails John Anderson sent Sally Nedry, which mention the Pfizer meeting. And which were sent before 2015.” And you’ll give this command using simple drop-down bars. If you store your eDiscovery files on your computer or on private servers, you’d only be able to access them when you’re at the office. Instead, the latest generation of eDiscovery applications uses the Cloud. The Cloud has been around for a while. In fact, if you use Dropbox, Google Drive, or any Apple product, then you’re already in the Cloud. Here’s how it works: Software giants like Amazon and Google lease storage and computing power to businesses all over the world. And their thousands of interconnected servers form a public ‘Cloud.’ Learn more about Cloud eDiscovery. Since GoldFynch stores your files in the Cloud, you can access them on-the-go – you’ll only need a laptop and an internet connection. And small law firms can use GoldFynch (and the Cloud) to collaborate with each other internationally. GoldFynch takes Cloud-computing one step further by using the Software as a Service (SaaS) model. Here, a vendor hosts and manages applications, making them available to clients via the internet. That’s why you don’t need to download and install GoldFynch. It runs in the Cloud and the GoldFynch team handles all the technical stuff. So you won’t need a dedicated IT department to help you troubleshoot problems. Plus, GoldFynch is designed, developed, and run by the same team, so technical support isn’t outsourced. Which means your tech issues get sorted out much faster. All you have to do is pay a monthly subscription and get on with being a lawyer. Don’t pay for unnecessary storage space. Need less space? Downgrade your plan. It’ll take just a few clicks. And since the pricing is prorated, you pay only for the space you’ve used. So, if you have an 8 GB plan for half the month and then you change it, you’d pay for only that half-month. 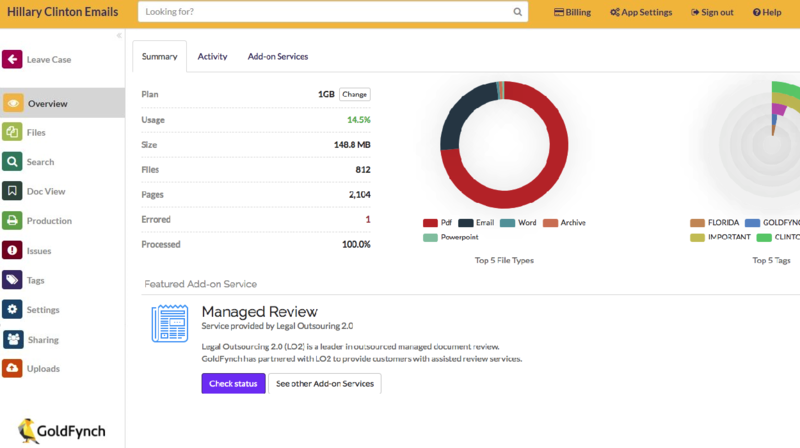 This cuts costs and makes eDiscovery much more affordable. Learn more prorated pricing with GoldFynch.